This June sees the 80th birthday of Colin Wilson, a writer who has played a key role (see this site's page on Wilson) in both the criticism and continued publication of David Lindsay's works. 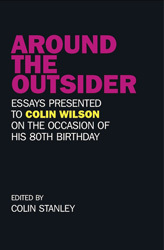 Wilson's oeuvre is wide and varied, and is celebrated in a festschrift issued next month by O Books, Around the Outsider: Essays Presented to Colin Wilson on the Occasion of His 80th Birthday . Edited by Colin Stanley, Around the Outsider includes essays on Wilson's novels, literary criticism, criminology, philosophy, autobiography, etc., from a host of writers and academics, including David Power (who has written a book on David Lindsay). It also has an essay by me, specifically about Colin Wilson's writings on Lindsay.